After a lengthy investigation the Health Care Complaints Commission (HCCC) have finally handed down their findings into the Australian Vaccination Network (AVN). The commission concluded that the AVN provide misleading information about vaccination and must post disclaimers on their website clearly stating they are anti-vaccination. The report found evidence that the AVN misleads readers by using reliable and peer reviewed literature but selectively quotes from it, often in contradiction to the conclusions or findings of the studies. The AVN also gives non-peer reviewed and anecdotal material the same authority as peer-reviewed literature. But this is interesting – she claims to have actually read the studies? This was not the impression Tom Sidwell gleaned when he analysed one of Meryl’s responses to the HCCC a few months back. Unless she intended to copy/paste mistakes, which were traced back to whale.to and other anti-vax conspiracy websites. This case was somewhat of a test for the HCCC, since it was not immediately clear if the AVN even fell under the HCCC legislation. Initially the Commisssion had to establish if the AVN could be classified as “health care providers”. Yet the commission disagreed with this, noting “the provision of health education was evident” on their website and also “Mrs Dorey participating in pregnancy discussion groups and in lecturing at universities” did indeed constitute health education. Even more embarrassing for Dorey was her own constitution which stated the purposes of the AVN were “the advancement and promotion of education and learning amongst the public”. She now claims to be seeking legal advice on this caveat, despite the fact that she has already had 12 months to do so? Odd. The Commission focussed cheifly on the issues raised by Mr McLeod and Mr and Mrs McCaffery in relation to the AVN website. Here they examined the post “10 reasons why parents question vaccination” which consists of such statements as “vaccines have never been tested”, “vaccines contain toxic additives and heavy metals” and “vaccines do not necessarily protect against infectious diseases”. They asked Mrs Dorey to provide evidence for these claims. The Commission analysed references provided by Mrs Dorey and noted many were not relevant to her claims, she was guilty of cherry picking or omitting data to support her claims and other information was demonstrably false. Of note is her citation of an article about Gardasil from Natural News. com – yes that guy – where she omitted paragraphs to reinforce the claim that the vaccine had been linked to deaths in young women. On other vaccines the report stated; “The AVN has selectively quoted information to suggest vaccination against meningococcal disease has been ineffective when there is no evidence of this”. If the AVN fails to comply the commission will issue a public statement. Of course we had hoped the HCCC could have done more to limit the dissemination of false information by the AVN, but at least the resulting media coverage will shine some light on the true nature of the AVN. Surprisingly, in her own response to the Commission, Meryl Dorey in fact admitted to being anti-vaccination, stating there is a need to provide an alternative to mainstream vaccination information. No longer can Ms Dorey hide behind “we are not anti-vax we are pro choice” which has always been her public persona. Meryl has already issued a press release stating that the report constitutes an “outrageous attack”; “the threat to freedom of speech and the implications regarding loss of medical choice inherent in this decision make this an issue that cannot go unchallenged”. 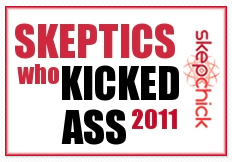 Interestingly, all references to skeptics with a capital “S” (thereby inferring Australian Skeptics) have been removed and replaced with Stop the AVN and their supporters. The story has also been reported on 6 minutes here which contains a link to the full article as a pdf. There is already a comment from Age of Autism UK editor John Stone, the same website who recently referred to the action as “fascist“. Apologies for any errors in the initial post, I am currently at TAM8, and am suffering from severe sleep deprivation! Plus, the post was written between the hours of 2 am and 5 am Las Vegas time (yawn). Since then, I have had 4 hrs sleep and made some changes, plus others have now blogged the story.